"In the fall of the year, this cry is abundantly heard all over the city." 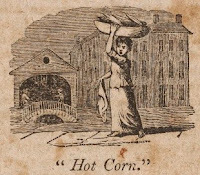 Thomas Jefferson made a chart of the “Vegetable market of Washington, during a period of 8 years, 1801-1809,” and listed corn being available from July 8 to the end of September. This cut represents a girl, with a dish of corn on her head, passing along the streets, crying, “hot corn,” “hot corn.” In the fall of the year, this cry is abundantly heard all over the city, from children whose business it to gather cents, by distributing corn to those who are disposed to regale themselves with an ear. It is boiled in the husks while green, and, with the addition of a little salt, which the children carry with them, is very pleasant eating. This very valuable grain, of which an abundance is raised and consumed as food, by man, beast, and poultry, beside great quantities shipped to foreign markets, is called Indian corn, being first found among the natives of this country. The Europeans, to this day, have very little idea of using it as food; but Americans, by education and use, know its value. The manner of using this corn in America, is various. It has this advantage over wheat, that subsistence may be drawn from your corn fields long before the general harvest for the green ears roasted, are delicate food; and as the corn ripens and grows harder, the ears boil'd are good eating, with butter and salt. When it is ripe, the corn parch'd and ground into meal, is the hunting and war provision of the Indians; being light to carry, arid affording good nourishment. They mix a little of it with water, and it needs no other cooking, having already pase'd the fire in the parching. The grain soaked in water, will part with its skin when beat in a large mortar with a wooden pestle: then it is boiled and eaten with milk. Being pounded coarsely, dry, it is also boil'd and eaten as rice. Bag puddings, and bak'd puddings made of it properly, are very good. The meal is also boil'd with water, to make what they call a hasty pudding, which they eat with butter and sugar, or with milk. This hasty pudding, or boil'd meal, being mix'd with twice as much wheat flour, and worked into loaves, makes much better and pleasanter bread than flour alone.